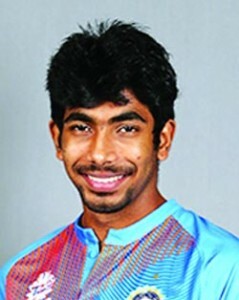 Jasprit Singh Bumrah, born on 6 December 1993 in Ahmedabad into a Punjabi Sikh family is an Indian cricketer who plays as a Right arm Fast bowler for the Indian national cricket team. 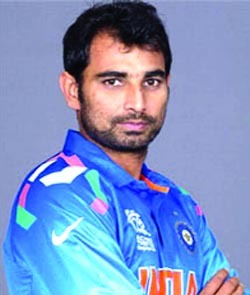 After a couple of moderately successful seasons with the Mumbai Indians at the Indian Premier League, and with his domestic team Gujarat, he was named in India’s squad for its 2015-16 series against Australia, as a replacement to an injured Bhuvneshwar Kumar. He consequently made his debut in One Day Internationals & Twenty20 Internationals in 2015-16 series against Australia. He started his bowling career by playing for the Gujarat under-19 team. He made his Indian Premier League debut with the Mumbai Indians in 2013. He showed some promise in his bowling with some pace and swing, he has impressed many in the IPL with his bowling figures, in his debut match of IPL 2013 he took 3 wickets for 32 runs against the Royal Challengers Banglore. From a very young age he has been playing cricket, showing very minimal interest in education, Bumrah focused on his cricket and was supported throughout by his parents. Bumrah made his T20I debut in 27 January 2016 against Australia cricket team. He reached into the limelight due to his ability to bowl yorkers at the right time and perform well in the death. The good thing with Bumrah is that he has a slightly unorthodox action thus making it more difficult for batsmen to pick him up soon. Also, his ability to bowl yorkers consistently has made him the leader of the Indian Cricket Team’s death bowling. Bumrah is a different bowler in pitches that assist fast bowling. The youngster bowls outside the off-stump or short quite consistently. 1. Who won 1st KPL Pink Ball Cricket Tournament title? 2. Who won the first semifinal of 1st KPL Cricket Tournament? 3. Who won Budding Cricket Tourney title? 4. Who launched Sania Mirza’s autobiography? 5. Who won Summer Cup title? Answers of the last week: 1. Khalsa Club 2. Rakesh Kumar 3. Ravi Chandran Ashwin 4. 7 medals 5. Narsingh Yadav. The Best entry of this week was received from Rahul Sharma of Subash Nagar. The other entries of the week were from Sanjay Dhar of Lower Laxmi Nagar, Sarwal, Krish Sharma of Janipur Colony, Satpal Singh of Shastri Nagar, Danish Sharma of Narwal, Suman of Bishnah, Mohammad Iqbal of Channi Himmat, Sunil Thakur of Udhampur and Tejveer Singh of Dashmesh Nagar, Digiana.